Looking for some great restaurants to enjoy a meal in Old Quebec City? 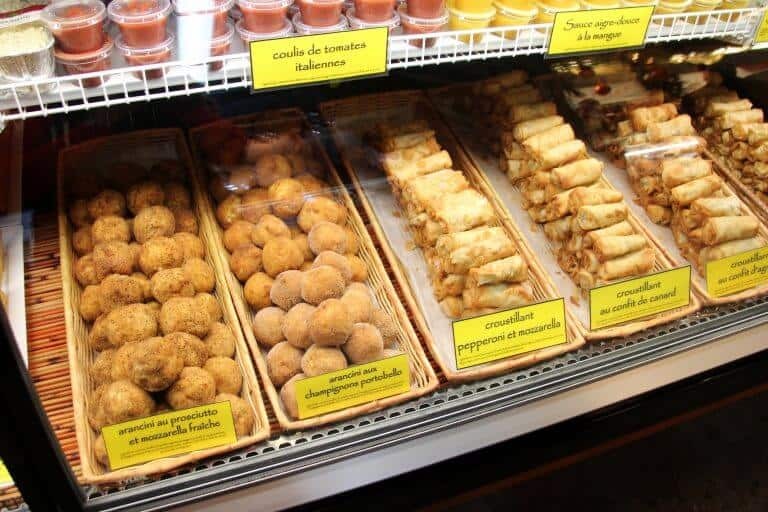 We’ve got you covered from traditional Quebec food to delicious coffee and sweets. Bringing the kids? We’ve also got tips on some family-friendly restaurants. 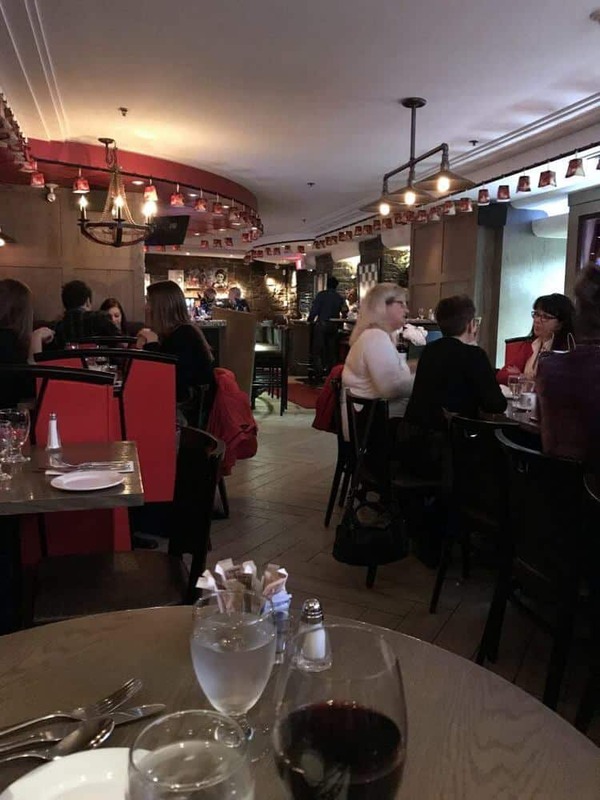 All of the restaurants I recommend are inside the walls of the Old Quebec City and close to all the Quebec City attractions. 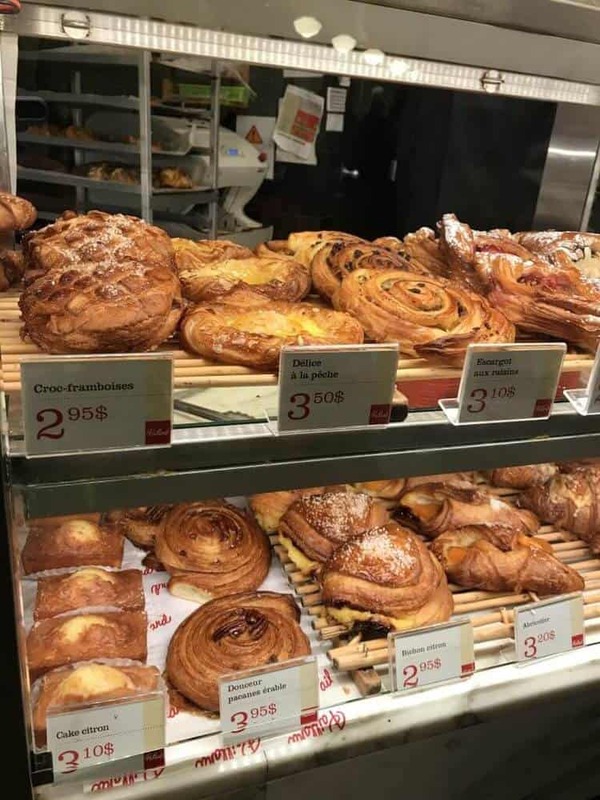 If you’ve ever been to France, you know how amazing their bakeries are! Full of delicious treats and savory foods to keep you wanting more. Paillard was on the list from the very beginning because I knew I needed a flaky croissant with chocolate and some macarons. 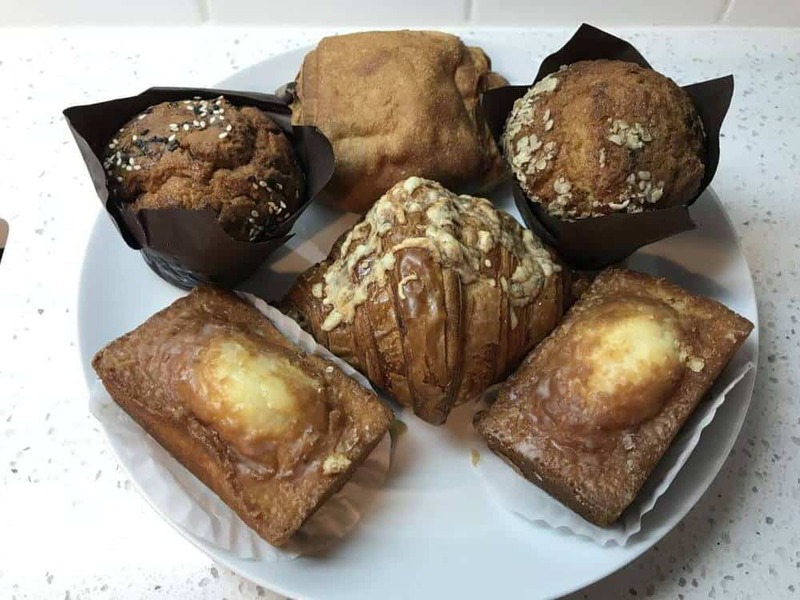 The bakery and pastry shop did not disappoint! What did we order? Thanks for the Quebec Board of Tourism, we had vouchers to allow for quite a selection. Bonus for my readers: I’ll tell you what is best! The cake citron (lemon cake) was amazing. Fluffy cake with a zest of lemon and it melted in your mouth. It’s a good thing we bought two because they were a hot commodity! The chocolate croissant was also delicious. It is truly an art to make sure the chocolate is evenly distributed in the croissant while keeping the croissant flaky and filled with layers of soft crust between each bite. We weren’t really a fan of the muffins. We tried two different types and thought they didn’t have enough moisture and needed coffee/hot chocolate to go with them. The cheese croissant was also just ok. Probably best to be used for sandwiches with a slice of cheese. We also picked up a sleeve of macrons as a gift for our friends who watched our sweet pup, Calvin. Macrons are a favorite due to their small size and multiple flavors. I like chocolate; my husband prefers cafe and my son is all about lemon. 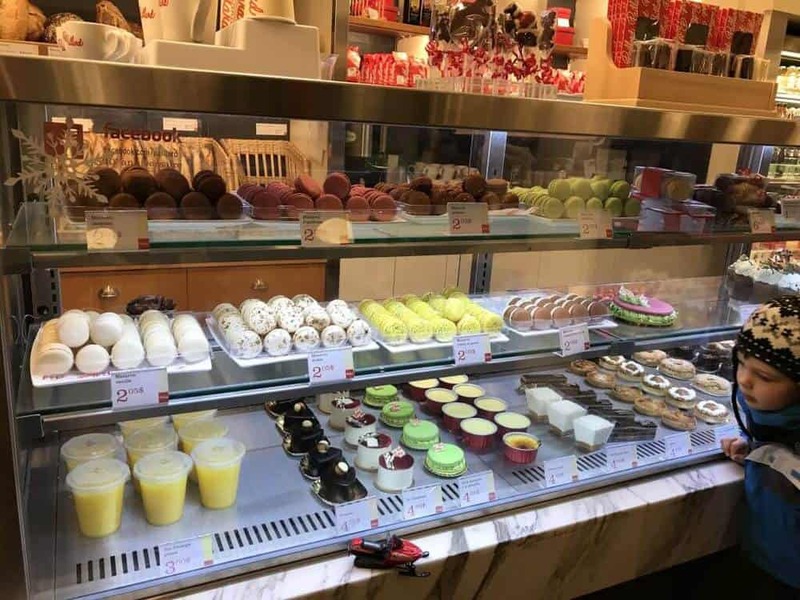 If you are looking for a gift, there is nothing better than fresh macarons from a French bakery. If our order wasn’t big enough, we also ordered breakfast sandwiches which were ok. The bread (ciabatta style) was a bit rough, so I’d suggest getting the croissant breakfast sandwich. Overall we were delighted with our experience at Paillard. The servers were prompt, courteous and the food was well packaged and prepared. We will have to try some of the delectable desserts on a return trip! Kid Friendly? Yes! With quick counter service, plenty of seating, high chairs, and clean bathrooms, it’s perfect for families. This was a favorite breakfast spot, but they are also open all day. We ended up returning one night to grab dinner for our son on the way back to our vacation rental. What did we order: On our first visit, we made a beeline for the savory breakfast crepes. We ordered our son the ham and cheese crepes, which my husband and I shared the spinach, egg and cheese crepe. Both came with a side of fondue style cheese. 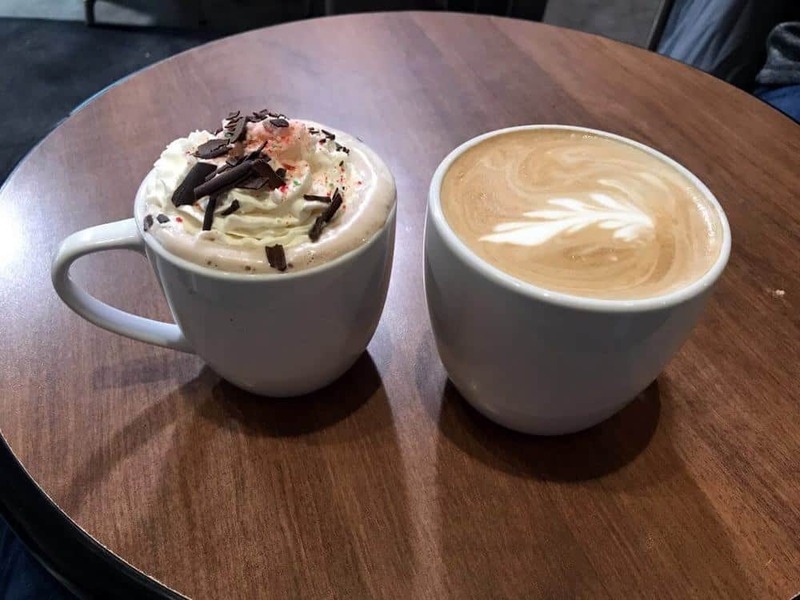 I ordered a peppermint hot chocolate, and my husband ordered a cafe latte. Everything was amazing, no complaints. The crepes were a perfect consistency, and the fillings were fresh and well balanced. On our second visit, we ordered another savory crepe, and then my husband and I shared a banana with Nutella crepe, another great visit with excellent interaction with the servers. 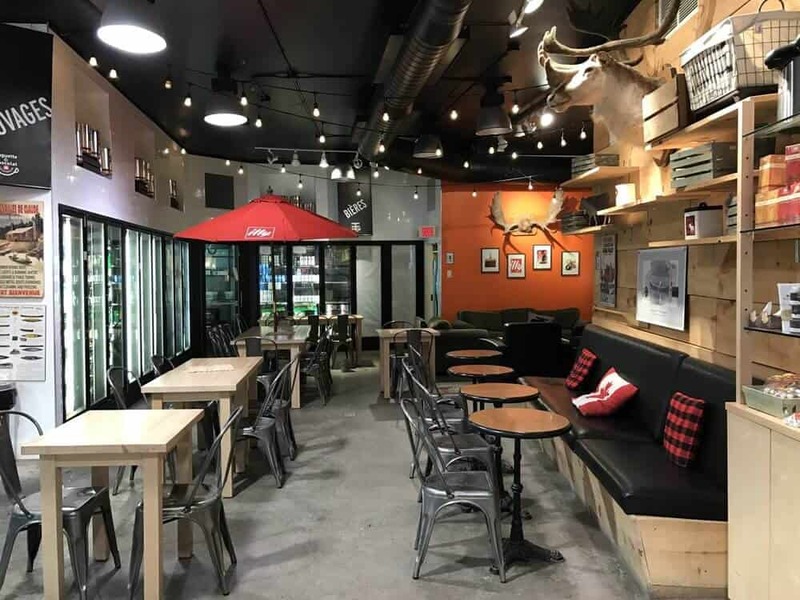 There is ample seating inside, so don’t let the small storefront make you think otherwise. Seating options range from comfy sofas to standard tables. TIP: Be sure to save your receipt, it has the code to use the restrooms. Kid Friendly? Yes! Ordering is done at the counter, and the food came out relatively quickly. We didn’t notice any high chairs, but with the booths, it would be easy to accommodate little ones. Clean bathrooms are just around the corner in the back. This was our first taste of food in Quebec City. We arrived just around dinner time from the airport and Portofino was literally around the corner from where we stayed. It is a quaint restaurant with authentic Italian cuisine. 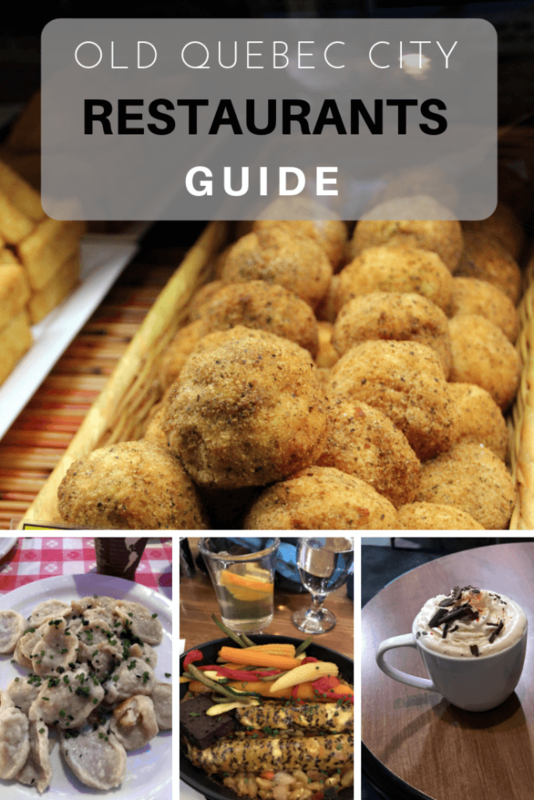 What did we order: We started with their Arancini with Mushrooms and garlic bread. 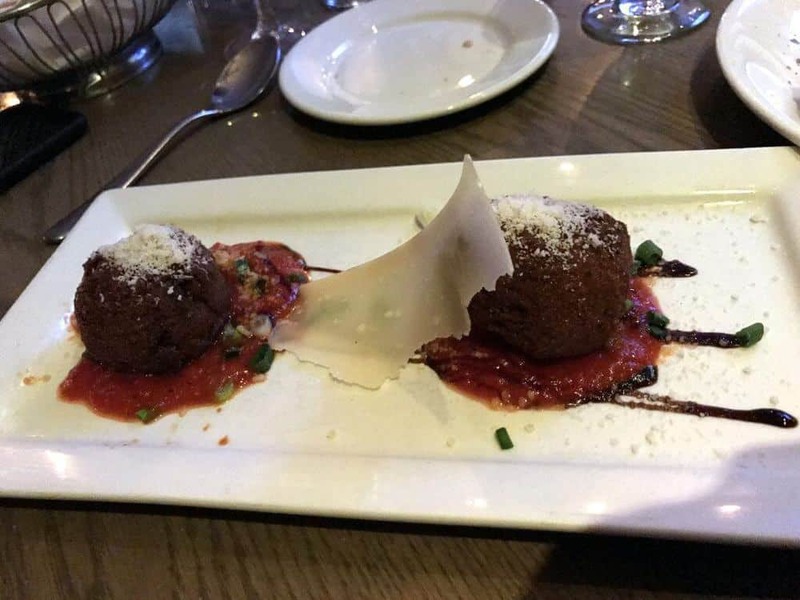 I liked the Arancini with the marinara but thought the garlic bread was too oily. We also each ordered a glass on their house red, which was good. Next up was a Minestrone Soup and the French Onion soup. My husband’s Minestrone Soup was the better of the two options. The broth had a nice flavor with the addition of mixed vegetables of varying types. The French Onion soup lacked a strong flavor, and the onion slices were quite large. It was a light dinner after a full day of traveling. The restaurant has rave reviews on Tripadvisor, so I think it would be worth a visit back to try their pizzas and pasta. For a Thursday night, it was bustling with groups, and they had live entertainment towards the bar area. We did not make reservations and were able to get a table, but I’d look at making reservations on Friday and Saturday evenings. If you happen to pick up a local guide to Old Quebec City, be sure to look for a coupon inside the book for Portofino. Kid Friendly? Maybe, it depends on the ages of your children. Pasta is a favorite in this family, and we brought some items to keep our son occupied. But the restaurant was loud with lots of groups and live music. 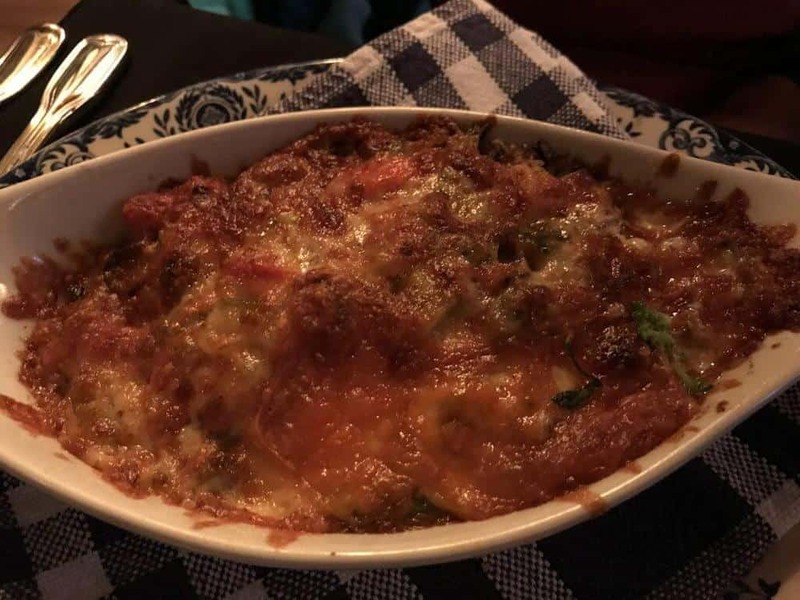 When we started looking for places to dine, we knew we wanted an Old Quebec City restaurant that would provide us with a traditional meal. 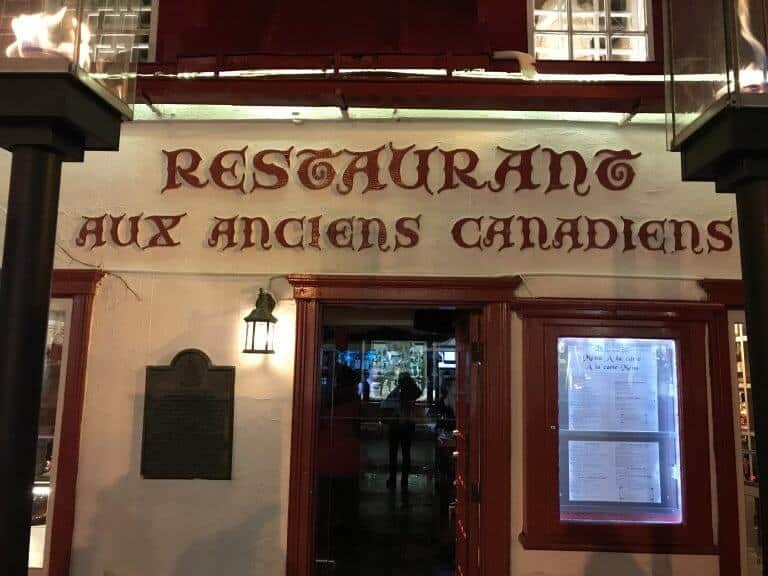 Aux Anciens Canadiens is located in an old historic home and has been serving food since 1675. It offers gourmet Quebec cuisine with meat pies and maple-inspired deserts. What did we order? If you dine before 5:45 pm, then you can take advantage of their $19.95 three-course meal (offered every day) with your choice of beer or house wine. Be careful with added upgrades on specific options, but we felt like there were plenty of options included in the original pricing. I ordered a glass of house wine (red), for starters I had their soup of the day (vegetable soup), then for my main course I ordered the Coulibiac style salmon, lobster sauce and small vegetables and finished with the Maple bread pudding. Each course was well prepared, beautifully presented and full of flavor. I don’t think I would order the salmon again, but only because I’d like to try something different next time. 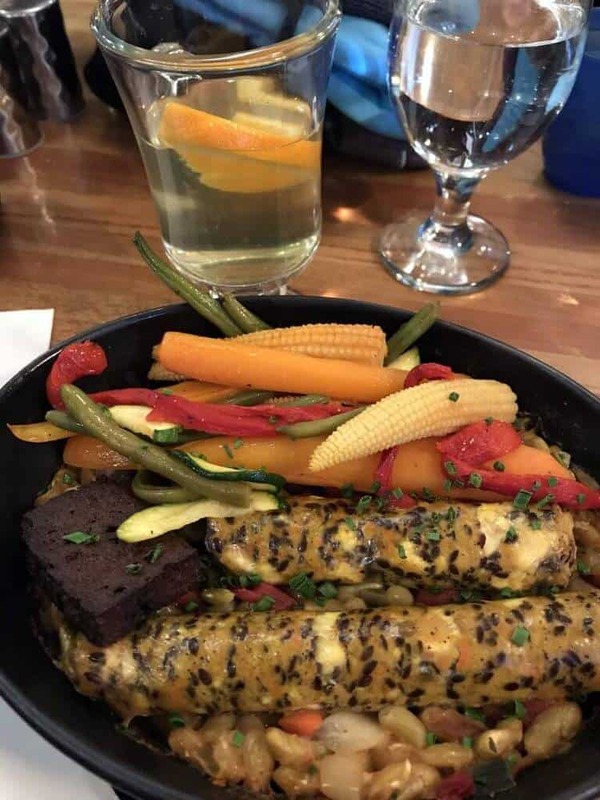 My husband ordered the beer on tap, soup of the day (vegetable soup) and paid an extra $3 to upgrade to the Vegetarian homemade ratatouille on wild rice au gratin. 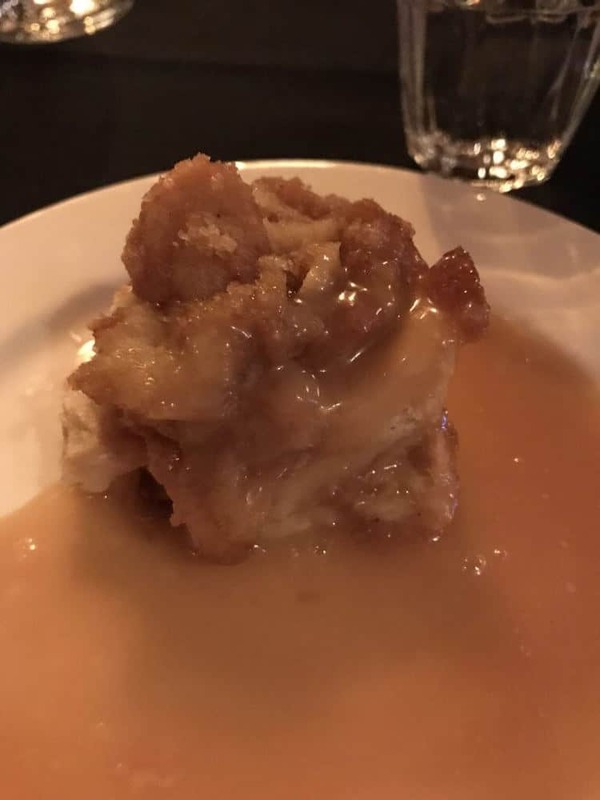 For dessert, he had the Maple upside down cake. He said the beer was excellent (and that means quite a bit coming from someone who lived in Germany), the vegetable soup was delicious, even though he shared most of his with our son. The vegetarian ratatouille was crispy on the outside, the vegetables were well cooked, and it had a sweet flavor. The desert was his favorite, and he hardly wanted to share! We almost ordered a second one to go. Kid Friendly? Maybe. Depends on when you plan to dine. At 4:30 pm the restaurant was relatively quiet, and we were able to have a table located in the back of the restaurant. Our son is well behaved in restaurants and is content to play with his toys. 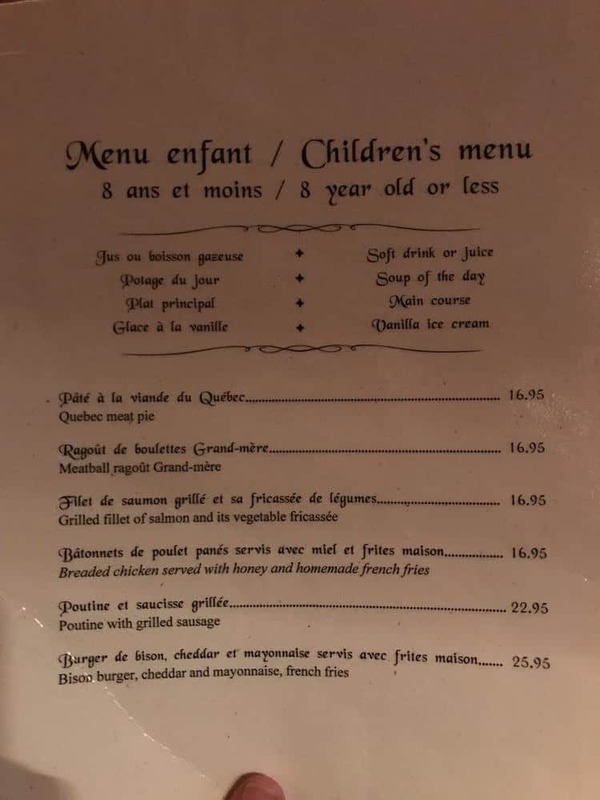 We felt like the child’s menu was overpriced because the dishes were the same size as the adults and we knew our son would not eat a full three-course dinner at age four. We elected to let him eat off our plates, which was perfectly fine with the staff. We did not notice any highchairs and the tables were close together, so be sure to fold up the stroller and leave it by the door. Bathrooms are located upstairs. This was our favorite place to eat during our five-day trip! 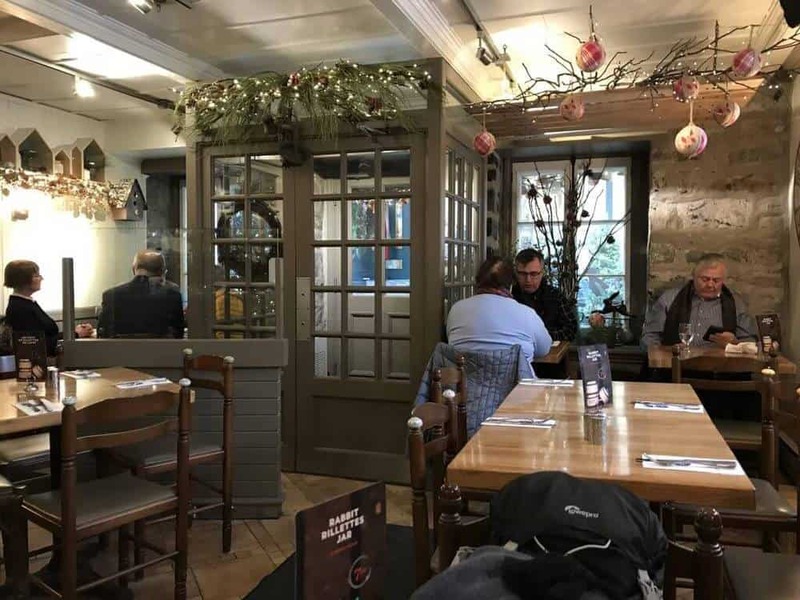 It is a smaller restaurant located just off the famous Petit Champlain and just steps from the Funicular. What did we order? For drinks, my husband and I both ordered their spiced cider. A fellow blogger friend later told me that their hot chocolate is out of the world, so please go and tell me! For lunch, my husband ordered soup, which was delicious. 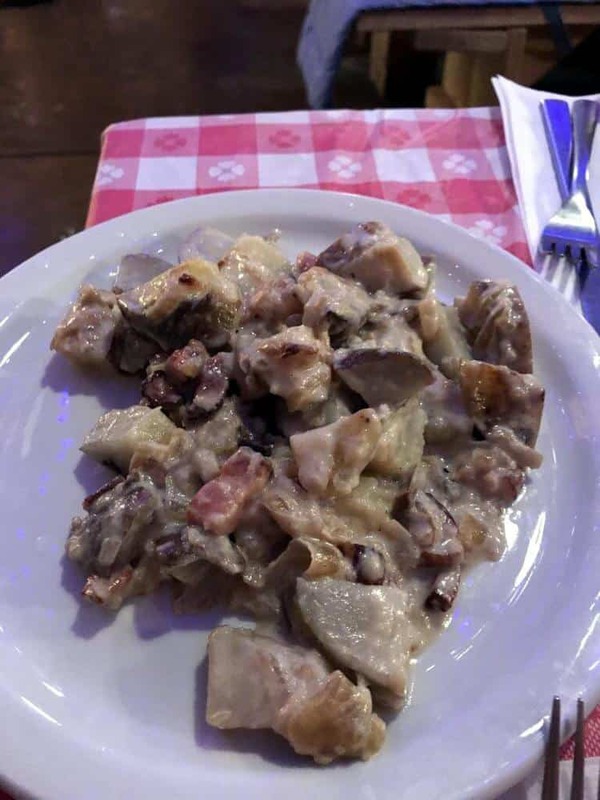 I ordered one of their famous cassoulets and it did not disappoint. Our son enjoyed his own three-course meal (for only $8). He had bacon wrapped sausages to start, then tagliatelle bolognese for his main dish with a cookie for dessert. 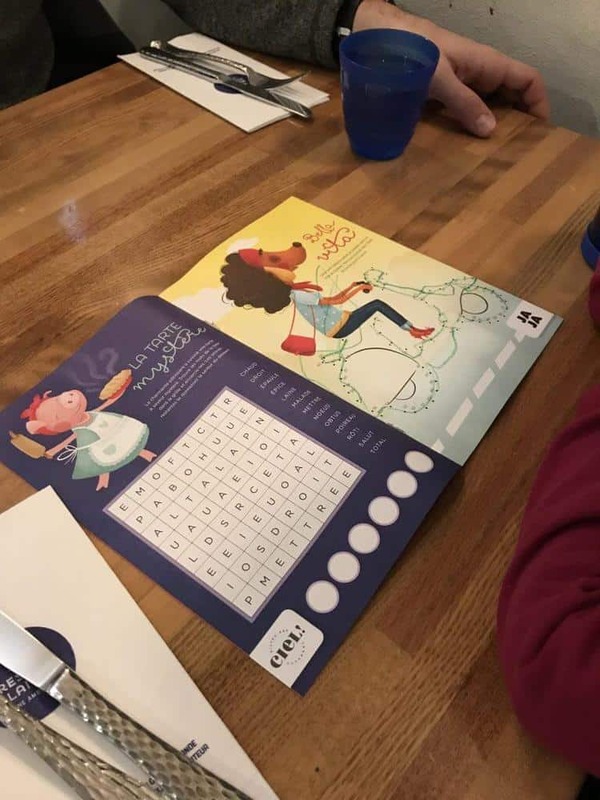 The menu also included a child’s drink. Kid Friendly? A huge resounding YES! When we arrived, they gave our son a nice multi-page activity booklet with coloring crayons. 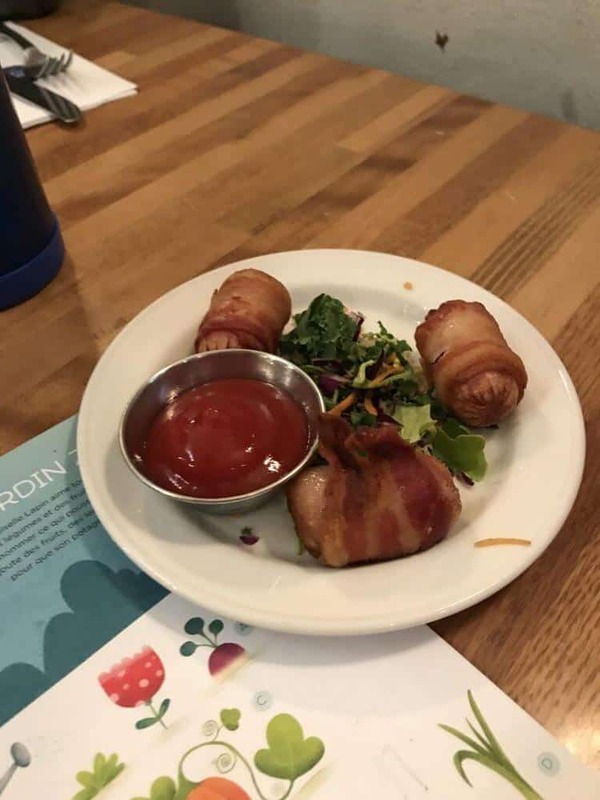 The menu featured kid-friendly, but also healthy options. Then at the end of our visit, they asked if it was okay to bring over a surprise box, which my son was elated to pick out a selection (finger light). We saw other small children dining, and they had high chairs. 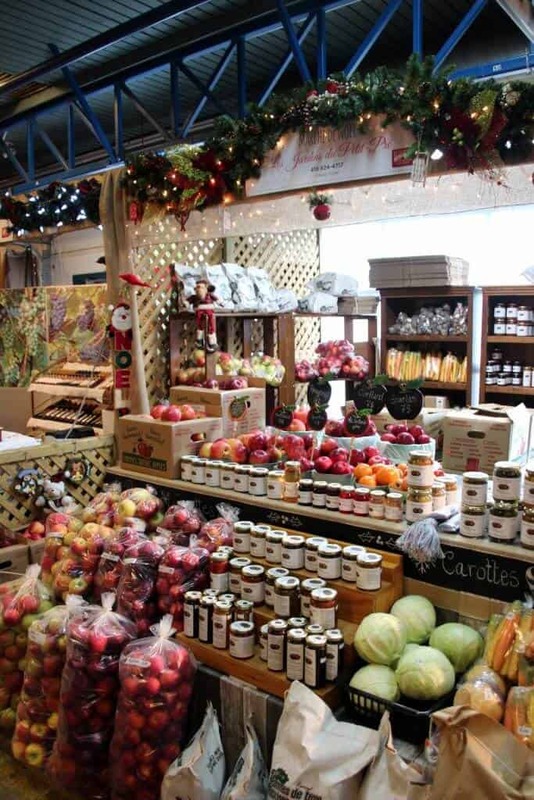 If you are visiting during the Christmas market season, then you get the bonus of experiencing the German treats located throughout the market stalls. The majority of the food was found around the Place de l’Hôtel de Ville. 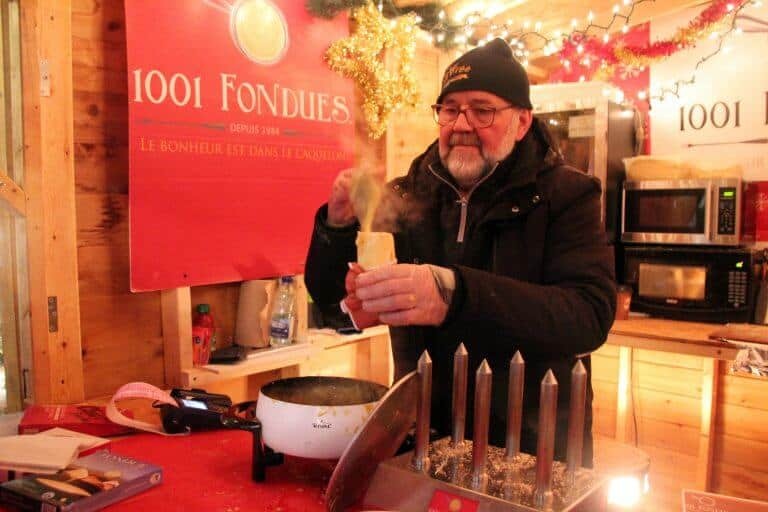 From German Sausage to cheese fondue in a bread tube and a full-service restaurant (located near Rue Pierre Olivier Chauveau) serving German fare with a Quebec flair. We tried the cheese fondue and liked it. We added sausage for our son, but he said it was too spicy, so be warned if you don’t like spice. It was a nice warm treat to enjoy on a cold evening night. On another night, we headed over to the BMW Alpine Chalet to enjoy this year’s creations from chef Frédéric Cyr, from the Fairmont Château Frontenac. 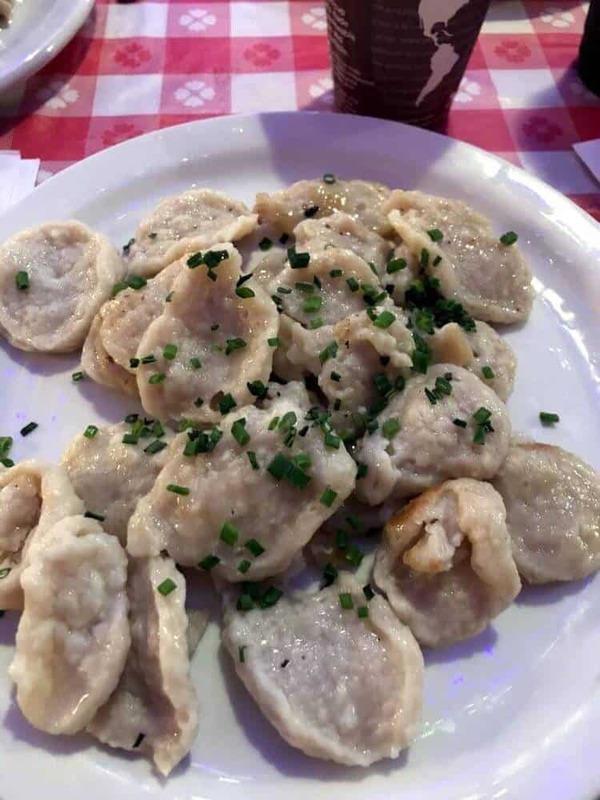 We chose a few items on the menu including the spaetzle, flammkuchen, and potatoes. My husband also ordered a local beer to help wash it all down. You order at the counter and then wait for your food before finding a seat at the multiple family style benches. Both of us liked the flammkuchen. The spaetzle lacked the gravy that Germany is known for (sauce on everything)! The potatoes were okay, creamy, but lacked a bit of pizzazz. 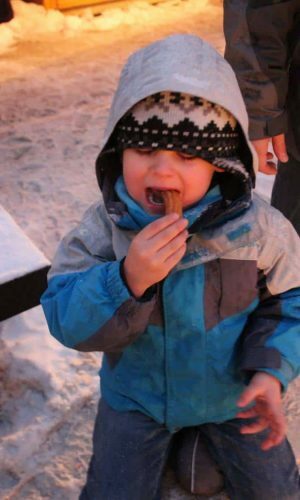 Another favorite food from the German Christmas Market in Old Quebec City was the churros. Located in the market South of the City Hall, the stand often has a long line, and it is worth the wait! Delicious churros with a sprinkle of cinnamon sugar. We ordered eight, and that almost wasn’t enough between the three of us. Find a spot near the firepits, and you’ve got the perfect place to enjoy this delectable treat. Looking for a unique way to enjoy lunch? 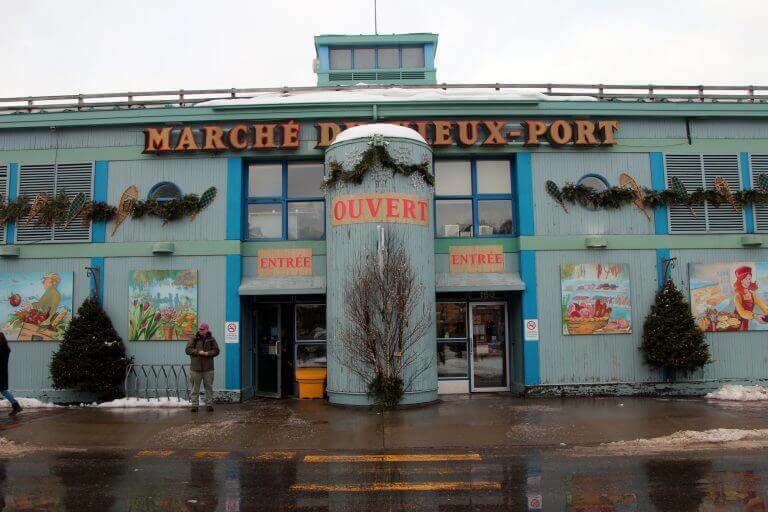 Then head over to the Old Port Market in Quebec City. Located in the lower town by the water and outside the walls, this market backs a punch with multiple eateries and market stalls to buy anything you can imagine from prepared food to items that you can take home to cook in the comfort of your vacation rental. We drove our car here after a trip to Montmorency Falls Park. There is plenty of parking, but always best to arrive just before peak times to avoid an added wait to find a spot to park. Once inside, you’ll want to walk around to see what there is to eat. 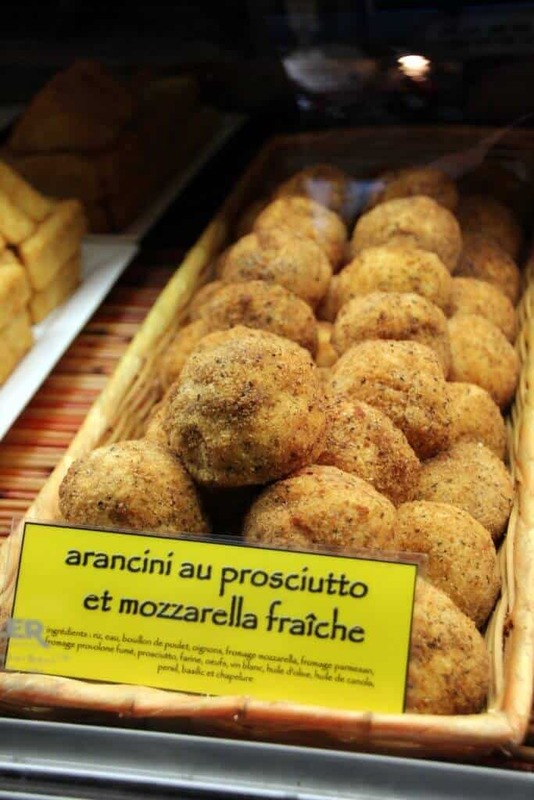 We quickly found freshly made pasta and arancini balls. We ordered a few to sample, and the staff warmed them up and labeled the packages. There weren’t any tables, but we found a little spot where a couple was playing violins and settled down to enjoy the appetizer. We then ventured off to sample some cured salamis, cheeses and sweets. We enjoyed the array of fruits, vegetables, and handmade local goods. 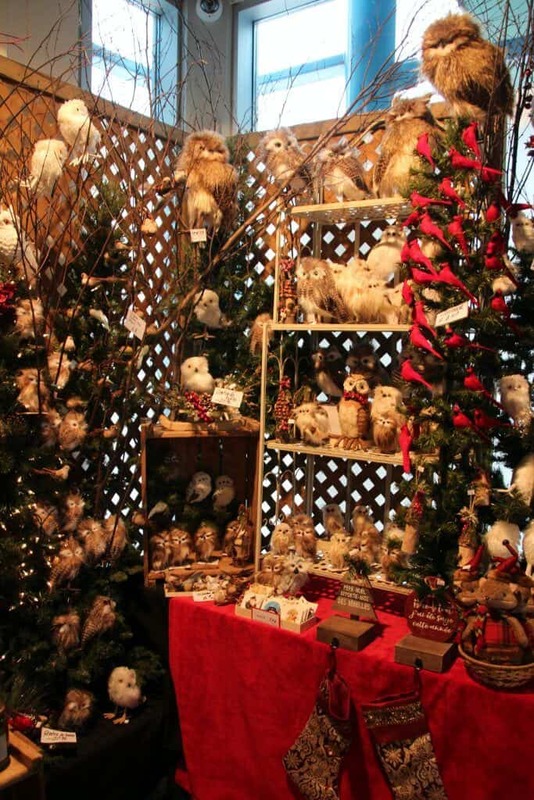 From live lobsters to churros and alpaca knitted hats….it was a shoppers delight! In the center of the market is a grab and go (or sit) type of cafe. They served poutine, burgers and simple fare. Located just beyond was a nice seating area with lounge seats and tables. This is the place to bring all of your treats and have a bit of a picnic! Be sure to grab some mini donuts for dessert. 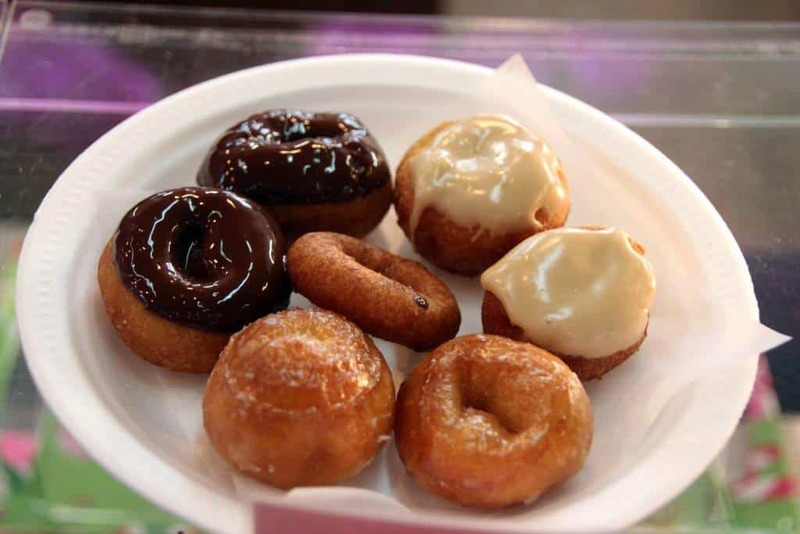 The glazed donuts were the best in our opinion. I hope I’ve helped in your search for fabulous restaurants to visit during your trip to Quebec City. Looking to try and make your own canadian meat pie? Head over to our friends at Little Miss Kate to check out their recipe. Want to read more about our five-day visit to Quebec City? 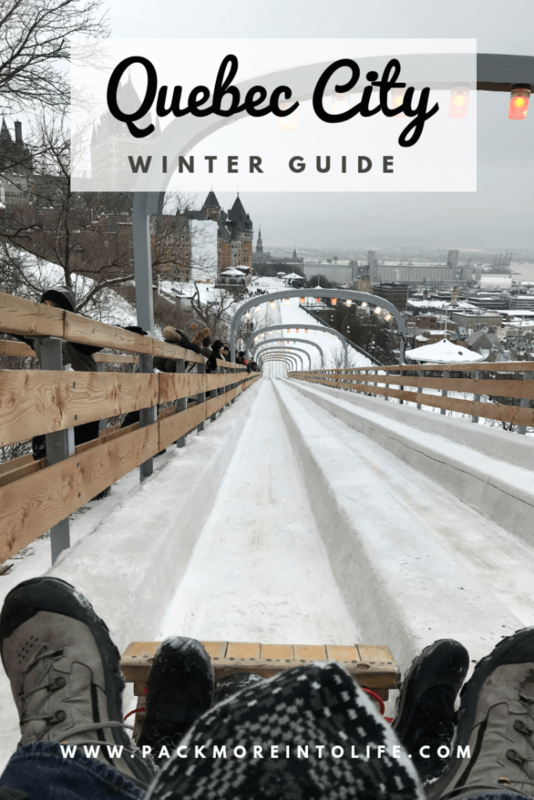 Head over to our blog post to discover what places to visit in Quebec with kids. We hope this list of our favorite restaurants in Old Quebec City Canada helps to inspire you to visit this amazing country! There is something special about visiting a place that isn’t inundated with visitors and has a wide variety of things to see and do. Feel free to ask any questions by contacting me, leaving a comment or finding me on facebook or instagram. I created this travel blog to help other families to explore the world with their kids and I hope I’ve inspired you. Want to read more? Head over to my destinations page and explore my interactive map, it’s pretty fun. Until next time!